I hope you were able to join us, and if not, please enjoy reading about it there. 24 Hours of TV starts tomorrow at high noon PST. The prep work continues: last night I unearthed the coffee table that will serve as our control center. Tonight B1-66er drops by to survey our channel choices, and I'll set up the iMac that we'll use as a webcam. Tomorrow the final preparations will include the all-important grocery run. We're gonna have some fun watching random TV all night, and we hope you can join in. Watch here for frequent updates starting tomorrow. We'll tentatively be hanging out in AIM chatroom TV24HR. Apple continues to maintain a huge market share in both downloaded songs and music players. Lots of folks seem convinced that Apple will slip (for typical examples, see here and here), but it hasn't happened yet. 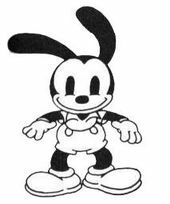 Walt Disney's first great cartoon creation was not Mickey Mouse: it was Oswald the Lucky Rabbit. Who? Oswald appeared in short cartoons that were presented by Universal Studios in 1927 and 1928. But according to legend, distributor Charles Mintz strongarmed the rights to Oswald, along with most of Disney's animators, from Disney in 1928. Later, Oswald became the property of Universal. Through the twisted, tangled world of Hollywood corporate mergers and acquistions, the long-forgotten Oswald eventually wound up belonging to NBC Universal. But somebody at Disney never forgot about Oswald. Starting this fall, NBC is going to show National Football League games on Sunday nights, and the network wanted broadcaster Al Michaels to announce those games. But Michaels had a contract with ABC Sports. And ABC belongs to...Disney. So when ABC Sports and NBC started talking about letting Michaels out of his contract so he could work for NBC, one of the items Disney wanted was the rights to the long-lost Oswald. And then NBC and Disney finished the deal a couple of weeks ago: Al Michaels was traded for Oswald the Lucky Rabbit. To celebrate, Disney held a "Welcome home, Oswald" party for its employees. Carrot cake was served. Next weekend is, of course, 24 Hours of TV. This past weekend I participated in a kind of training session for 24HoTV. In anticipation of 12 Olympic hockey games on TV, Barbara and I spent Friday and Saturday night planted in front of the TV watching the hockey live from Italy. We went two whole nights without visiting our bed, instead reading, doing puzzles, drifting in and out of consciousness on the couch and watching lots of hockey. Fun! Yes, Disneyland has a capacity. When it's reached, you'll see this sign, which is right next to the entrance gate, and set off by orange traffic cones in a very un-Disneylike presentation. Note that the sign is intentionally vague: it doesn't say whether they will actually let you in or not. Apparently the rules for that are more complex. It depends on whether you have a single or multi-day ticket, and maybe other factors -- I couldn't find out the exact rules. And if you're in the park and you leave, they might warn you that you won't be allowed back in. Hey, hockey fans: NBC's cable channels are delivering more Olympic hockey than you can possibly handle, and unlike most of the Olympics, the hockey games are all shown live. Saturday, Sunday, and Tuesday, there are 6 games each day, starting early in the morning (or the middle of the night, Pacific time). The full schedule is here. Check it out! Recently I toured the Computer History Museum in Mountain View, located in a remodeled old SGI building just down the block from Google and Microsoft. The tour was pretty fun, with lots of ancient big iron and zillions of personal computers, some of them very familiar. I was amused to see how much of my work experience is now literally history. Some folks have asked why the rules of 24 Hours of TV require us to change the channel every 15 minutes. It's because 24 hours of actual TV programming would not be weird or interesting enough to sustain us. By changing the show every 15 minutes, and by making the change random, we add strangeness that will enhance any mundane programming with the spice of surreality.